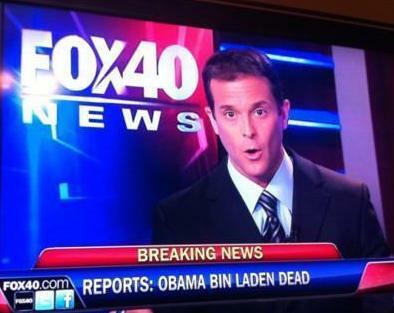 Fox40 News (Sacramento) chyron fail. 2003: President George W. Bush appears on the flight deck of the U.S.S. Abraham Lincoln, a “Mission Accomplished” banner prominently displayed above him and a portion of the carrier’s bridge creating a halo effect around his head. “Major combat operations in Iraq have ended,” pronounces Bush. “The battle of Iraq is one victory in a war on terror that began on September 11, 2001, and still goes on.” Later the Mission Accomplished banner becomes a oft-mocked symbol of U.S. misjudgments and mistakes in the long and costly occupation of Iraq. 2003: Jayson Blair, a 27-year-old reporter for the New York Times, resigns after the Times finds that he “committed frequent acts of journalistic fraud.” The ensuing scandal makes Blair a media celebrity and damages the reputation of the newspaper.